On the morning of May 22, 2018, I set out for water sampling of the Wild Rice River and the Red River with River Keeper’s Project Coordinator, Kimberly Morris. River Keepers is a non-profit organization whose mission is to advocate for sustainable use of the Red River in the Fargo-Moorhead area. I am a Sustainability student at Minnesota State University Moorhead, with an emphasis in Environmental Science, so I chose to assist with water quality monitoring for the first-hand experience with the Red River, and because I care about the quality and life of the ecosystem surrounding it. It was my first time water quality monitoring and I didn’t know much about the techniques going in, but I was really looking forward to learning. I arrived at River Keepers early that morning and we headed to the Wild Rice River which feeds into the Red River. It took about 25 minutes to reach our first site, a small bridge on 100th Avenue South near the Wild Rice Bar. It was cool, foggy, and alive with birds. We pulled aside and set up our area with safety cones. Sampling is done from the middle of the bridge every time, to ensure consistency. We then unloaded the equipment: a Van Dorn to collect the water, a measuring tape, bottles for holding samples, and a sonde that provides underwater readings on temperature, dissolved oxygen, and pH. We also used a Secchi tube to determine the clarity of the water, using our best judgement despite the overcast weather for most of the morning. It took four hours to collect all the samples, and by the end I felt much more comfortable with the equipment, so much so that I would do it again. I felt a stronger connection to the Red River, and to water in general. It is easy to take for granted, but when you are out there looking at the water up close and familiarizing yourself with its characteristics, you begin to realize your bond with it and the importance of keeping it healthy. 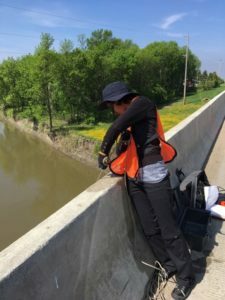 Water quality monitoring is much easier with two people, so if you are interested in assisting during River Keeper’s water quality monitoring season, you can fill out a volunteer form on River Keeper’s website or contact them directly. You can also visit river.watch to access River Keepers water quality data online.